If you are looking for puff pastry perfection look no further! 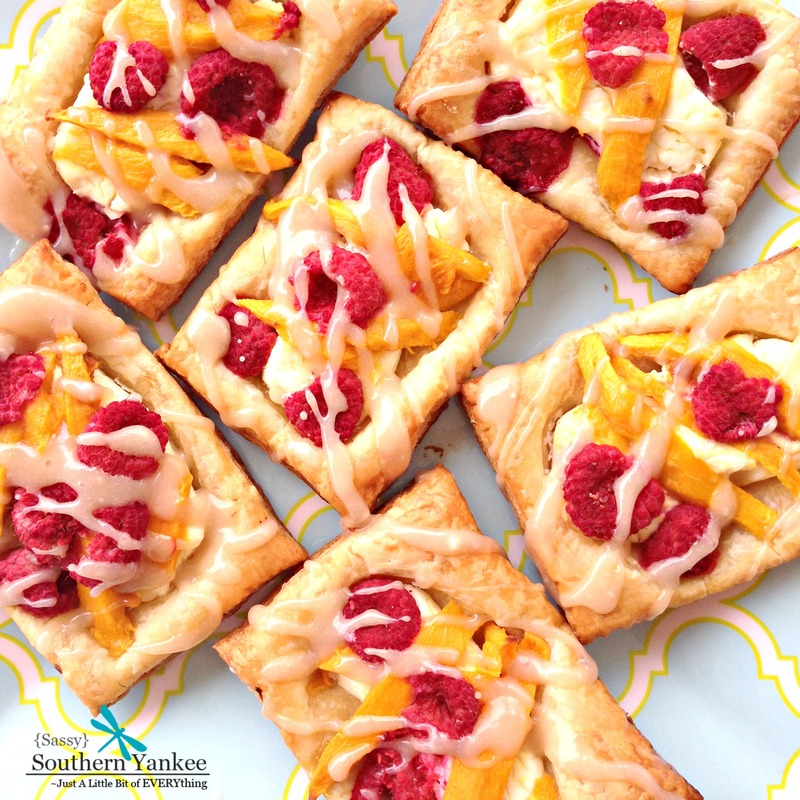 These Raspberry Mango Cream Cheese Danish will have you drooling. The best part is they can be on your table in as little as 15 minutes! I made these for brunch the other weekend and they were a hit! There are sure to impress all of your guests and they are beyond easy to make. The mango and raspberry pair perfectly with the cream cheese. These are full of gluten and dairy, so my followers with food allergies I’m sorry please don’t eat these! For those of you without allergies; enjoy EVERY.LAST.BITE! To get things started cut up the mango and wash the raspberries. If you’ve never used puff pastry before let me just tell you, you are in for a treat! It’s found in your freezer section at the local grocery store. Just prior to using the puff pastry remove it from the freezer to thaw. There will be two puff pastry sheets in the box so remove each of them and allow to thaw for about 40 mins until they are pliable but still cool. Once the puff pastry is thawed place a bit of flour onto a hard surface. 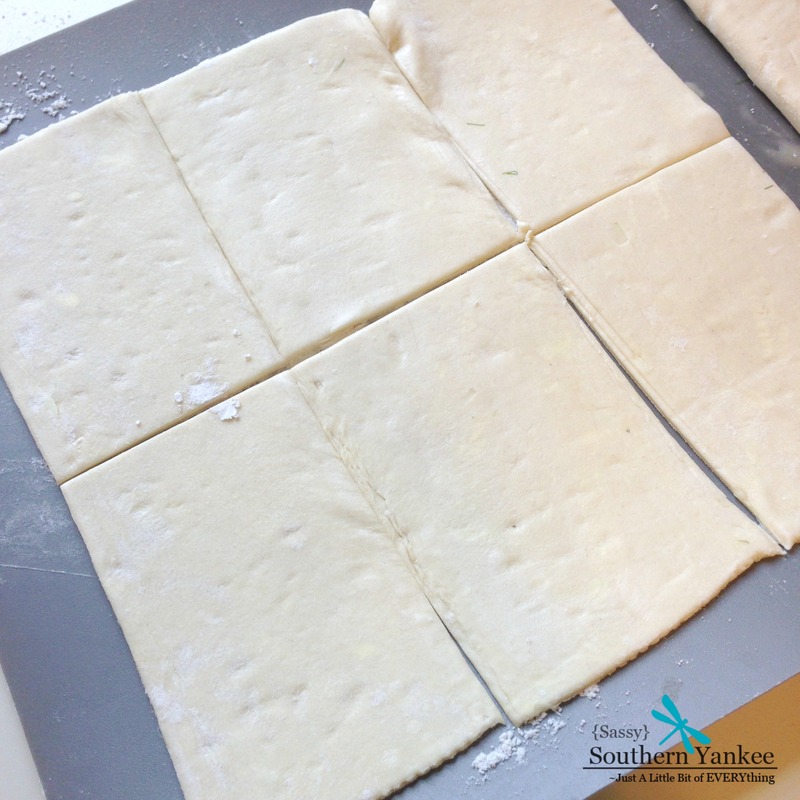 Use your rolling-pin to flatten them into a rectangle; then cut each piece into squares 3X3 (I had six squares). Place each square onto a greased cookie sheet. Using a sharp knife slice the cream cheese block into equal 8 pieces; set two pieces aside in a small bowl. Next place one piece of cream cheese onto the middle of each of the puff pastry squares. **If you wanted to add a step you could whip the cream cheese with a bit of powdered sugar and vanilla prior to putting it on the puff pastry. Next top the cream cheese with your favorite fruit. I used some fresh raspberries and mango. The combination was perfect with the cream cheese! Sprinkle the pastry with some sugar. Bake in the oven for 10-12 minuets until the cheese has melted and the pasty is golden brown and puffy. To make the cream cheese drizzle combine the remaining 2 blocks of cream cheese with the powdered sugar and vanilla. I placed mine in the microwave for about 30 seconds until melted and you can use a whisk to remove all the lumps and bumps. If the icing is too thick you can thin with a bit of milk or water. Drizzle over the warm pastries once you remove them from the oven. If you are looking for puff pastry perfection look no further! 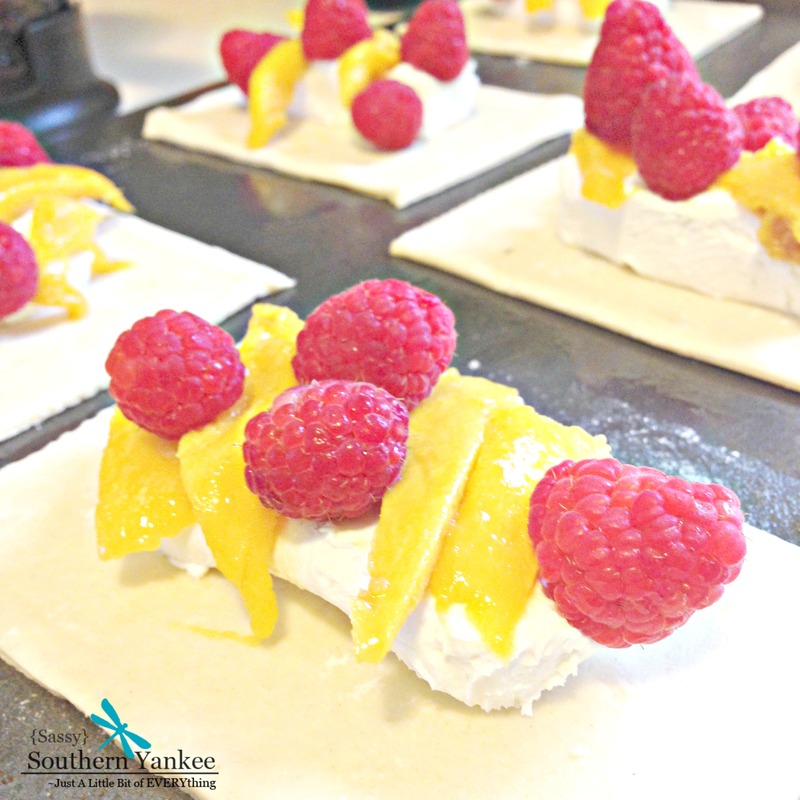 These Raspberry Mango Cream Cheese Danish will have you drooling. The best part is they can be on your table in as little as 15 minutes! I made these for brunch the other weekend and they were a hit! If you've never used puff pastry before let me just tell you, you are in for a treat! It's found in your freezer section at the local grocery store. Just prior to using the puff pastry remove it from the freezer to thaw. 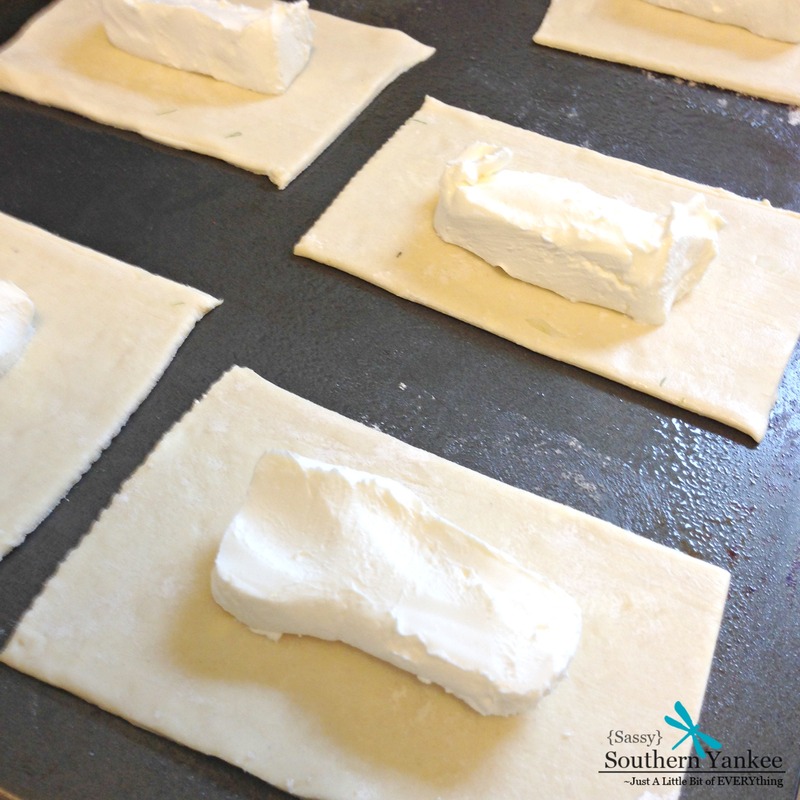 There will be two puff pastry sheets in the box so remove each of them and allow to thaw for about 40 mins until they are pliable but still cool. This entry was posted in Breakfast, Dessert, Main Course and tagged Baking, Breakfast, Bridal Shower, Brunch, Danish, easy, Easy Breakfast, Mango, Pastry, Puff pastry, quick, Quick Breakfast, Raspberry, Wedding Shower.